The mobile phone number directory 118800 has suspended its services in order to carry out technical repairs. The site's owner Connectivity admits it is difficult to handle the number of unsubscribe requests from mobile phone users. The site says that the downtime will also be used to make technical improvements to correct delays in connection times. It is not able to take ex-directory requests at the moment. In the meantime, "all ex-directory requests made by people in our directory to date are being processed. There will be no need to resend these requests", reads a statement on the company website. Connectivity says that it hopes to have the site up and running again soon, but until that happens, customers will only be able to use the 118800 service over the phone, and only then to access landline numbers. Anyone searching for a number can type the name and location of the person into the 118800 website. If the company has it, contact details will be sent in a text message to them. If they do, they will call them up while you are still on the line and ask them whether they are prepared to have your call put through to them. In neither case is the mobile phone number given over to the person making the request. 118800 gets its numbers from commercially available sources: market research companies, online businesses and number brokers. Connectivity launched the phone and web based service in mid-June. It admits it became operational sooner than it wanted to, but because of intense media interest, it decided to bring the start date forward. It concedes that its systems were not prepared. 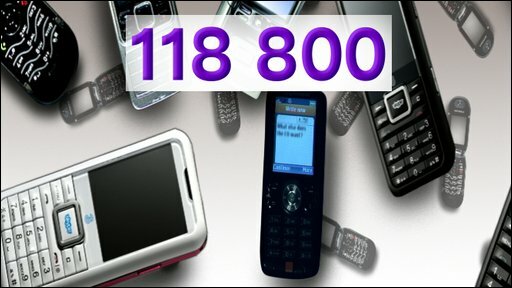 Concerns by some mobile phone customers led many to want to remove their number off the 11880 database and become ex directory. Hundreds of Working Lunch viewers have emailed in, reporting problems when trying to take their numbers off the company's list. The original story on the Working Lunch website covering the site's launch, had over 1.3 million hits last week after the link began to be circulated as a viral email. "We are accessing data in the same way that lots of other companies do for marketing purposes", Shona Forster, 118800's Marketing Director, told Working Lunch last month. Which screen is best for reading?